One of the benefits to physically being somewhere that lacks people and electric lights is that you can see the heavens at night so well. It’s no wonder that adventurous people flock to Alaska, then, to take in the nighttime sky. Indeed, 1st Alaska Outdoor School’s guides show tourists the “Northern Lights” after they arrive in Fairbanks and then venture out into the wilderness for prime viewing spots. The “Northern Lights” are bright, colorful, dancing lights seen above and below the magnetic poles of the northern and southern hemispheres of our planet. They’re breathtaking as they light up the sky with an eerie, almost magical glow. Just like we like to observe lights in the sky, imagine if you lived on Jupiter. Right now, because of intense solar storms, if you were on the surface of Jupiter you’d be witnessing their version of our “Northern Lights” that’s hundreds of times brighter than what we see! Researchers are currently studying Jupiter’s “aurora” (another name for lights in the sky) to see how solar storms make an impact. At issue is Jupiter’s magnetic field and how it’s influenced by the Sun. Apparently, solar storms compress part of the planet’s magnetic field area creating an X-ray aurora that can be seen by astronomers on Earth. There have even been 3D pictures taken of this phenomenon. Did you know NASA plans to send a mission to Jupiter soon to study the planet and its magnetic field more closely? The “Juno” mission will involve satellites orbiting Jupiter’s poles with the goal of learning how the planet originally came into being. 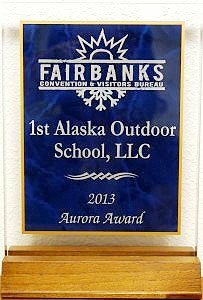 For now, know that Earth’s “Northern Lights” can be observed from Alaska via the 1st Alaska Outdoor School expeditions. If you’ve never been to Alaska, now’s the time to plan your sightseeing trip by calling 1st Alaska Outdoor School at 907-590-5900.